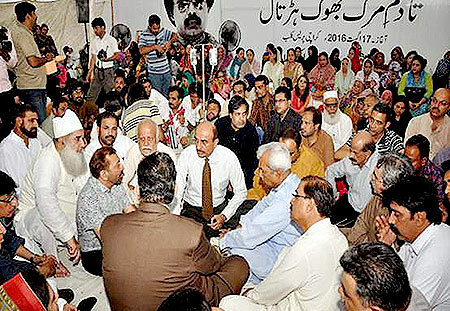 On August 17, 2016, some of the leaders and workers of MQM started a ‘hunger strike till death’ outside the Karachi Press Club against what they called were extrajudicial killings and arrests of their fellow party workers.1 This hunger strike ended on August 22, 2016, upon the orders of the MQM Chief Mr. Altaf Hussain, after a five-member delegation of MQM met with the Chief Minister of Sindh, Mr. Murad Ali Shah at the CM House bringing to his notice the party’s reservations over the on-going operation in Karachi and the alleged political victimisation of MQM.2 However, on the same day, Mr. Altaf Hussain decided to make a speech at the hunger strike camp in which he not only instigated his listeners to attack the media but also chanted slogans carrying anti-Pakistan sentiments. A few hours after the MQM Pakistan leadership cut off all ties with Mr. Altaf Hussain, an official notification through MQM London office, shared by MQM Convenor Mr. Nadeem Nusrat, was issued stating the handing over of complete powers of the party to the Rabita Committee in Pakistan.5 “I am handing over complete power related to policy making, decision making as well as organisational authority to the Rabita Committee,” the MQM chief stated. The saga did not end here and on August 27, 2016,6 another press conference was held by the (now) head of MQM Pakistan, Dr. Farooq Sattar, in which the declaration of complete disconnection with Mr. Altaf Hussain and the London office was made. 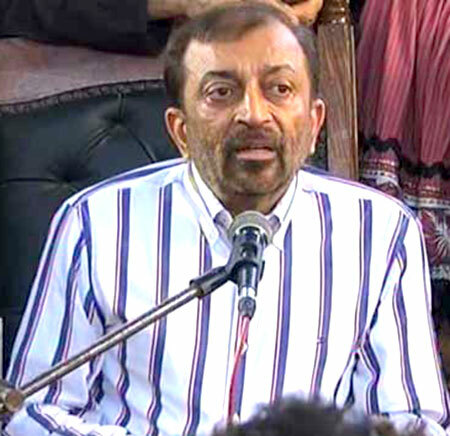 Whereas on August 23, 2016, Dr. Farooq Sattar had only dissociated the party from the MQM chief’s anti-Pakistan remarks and his power to make decisions for the party, this time he clarified the ambiguous situation by stating, “We have completely dissociated ourselves from Altaf Hussain ‘sahib’ and the London office. Now the MQM-Pakistan will make its own policies and take decisions which would have nothing to do with London secretariat.” In order to further clarify any confusions, on August 31, 2016, a meeting of the Rabita Committee Pakistan members chaired by Dr. Farooq Sattar took place in Karachi in which they sat down to discuss amendments to the party’s constitution. Dr. Farooq Sattar, now party leader, said that the party had now been made officially independent from any directions that could come from the London office.7 Along with a number of other party decisions, a key decision that was made in the meeting was omission of Article 9 (b) in the party constitution which stated: The Central Co-ordination Committee shall seek guidance from Mr. Altaf Hussain being the founder and ideologue, on the major issues, if it deem fit for ratification. The MQM was founded in 1984 and since then Mr. Altaf Hussain had remained its supreme leader, though Convenors and Deputy Convenors had been changing from time to time. In the past, Mr. Altaf Hussain had repeatedly suspended, removed and reinstated members of the Rabita Committee and at times even the entire Committee. It has always been understood that he was not merely an ideologue but held all the supreme executive powers of the party. Despite political ups and downs in Pakistan and London for MQM and its leader, the all-powerful position of Mr. Altaf Hussain as head of the party had always remained intact. Although the current alienation of the party with its founder has come about through a process of consultation among the members of the Rabita Committee Pakistan, it is still unclear how much support Mr. Altaf Hussain has in reality actually lost in the party and how much independent the party in Pakistan has become from the London office. On August 4, 2016, Prime Minister Nawaz Sharif, Parliamentary Leader of the PML-N in the National Assembly of Pakistan convened a parliamentary party meeting after a lapse over 2 years. The last such meeting had taken place on January 27, 2014. It is reported in the media that over 250 PML-N parliamentarians participated in the meeting where the Prime Minister spoke at length about development projects on-going in the country. The Prime Minister, however, did not hear out any of the problems of his parliamentarians.8 In fact, it has been reported that the Prime Minister even snubbed one of the MNA’s, Chaudhry Asadur Rehman, who was asked to stop talking and sit back in his seat. Neither any official presser of this meeting was released by the Prime Minister’s office nor the PML-N secretariat released any minutes of the meeting. On July 30, 2016, Senator Saeed Ghani was appointed Adviser to the Sindh Chief Minister, Mr. Murad Ali Shah, on Labour Affairs.9 In light of this development, on August 10, 2016, Chairman PPP Mr. Bilawal Bhutto-Zardari, asked Senator Saeed Ghani to retain his seat in the Senate but quit as the party’s Parliamentary Leader. Under Section 13 of the Political Parties Order, 2002, political parties, which are enlisted with the Election Commission of Pakistan (ECP), are required to file details of their accounts, liabilities, expenses and sources of income within 60 days after the close of a financial year. If a political party fails to do so, they stand disqualified from being allotted election symbols to take part in the electoral process. Most of the mainstream political parties, including the ruling party in the centre (PML-N) and the provincial ruling parties (PTI, PPP-P), failed to submit Statement of Accounts to the ECP in due time.